Click here for the Chinese (中文) review. 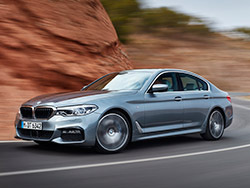 The mid-size sedan is the quintessential automotive configuration. It boasts four doors, a wealth of interior space for five passengers, an expansive trunk, and in my eyes, the most visually and structurally balanced shape amongst all others, including mid-engine sports cars and sleek SUV coupes. 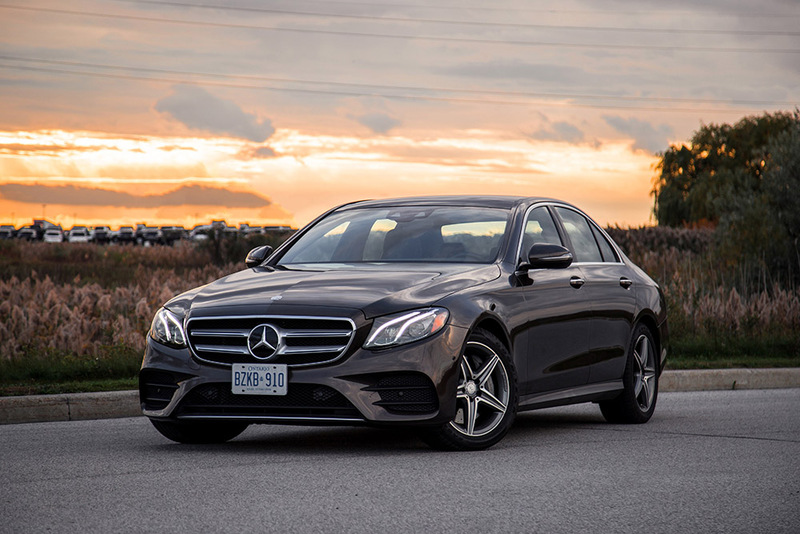 No other car has exemplified these proportions better than the E-Class, Mercedes’ bread and butter sedan, which is now reaching its 10th generation model year. At first glance, you’d have thought you were looking at a C-Class, or hell even a full-size S-Class from afar. The E-Class, which sits right in between, melds the best of both worlds into a corporate look that appears mature and grown up, like a C-Class that finally landed a new banking job. 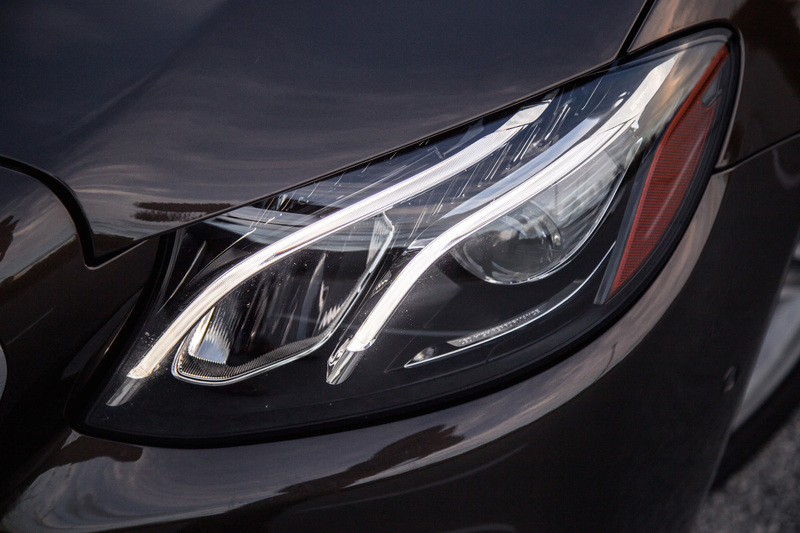 The new LED head and taillights make it hard to differentiate it from the family lineup, as does the hereditary louvre grill and identical 18-inch AMG wheels ($500). You can even spec the E-Class out with the standing star on the hood – good luck trying to tell that apart from an S-Class. The E-Class has not only lost weight from its predecessor, but the length has been stretched 43 mm, and the wheelbase too by 65 mm. This means more rear seat legroom. 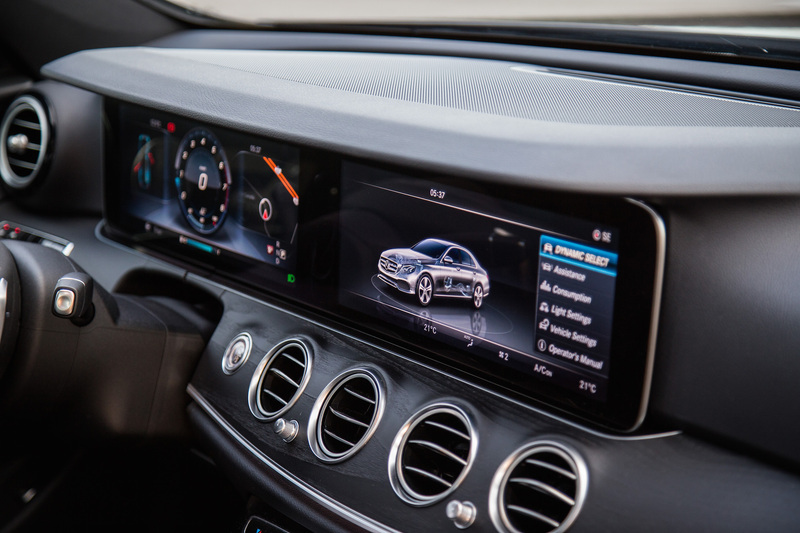 The interior has also been given a proper revision, taking screens, buttons, knobs, and displays from its S-Class mothership. But the real treat with the E-Class, aside from Mercedes-Benz’s newly designed keyfob (which looks outstanding), is that they’ve taken a page out of Volvo and Tesla and have loaded up this mid-size sedan with enough safety and convenience technology to blow the RAM out of a digital brain. What surprises us most is that the S-Class halo car is usually Mercedes-Benz’s testbed for future tech, but it seems like they’ve chosen the middle child in their portfolio to usher in a new era of tech. So where do we even start? 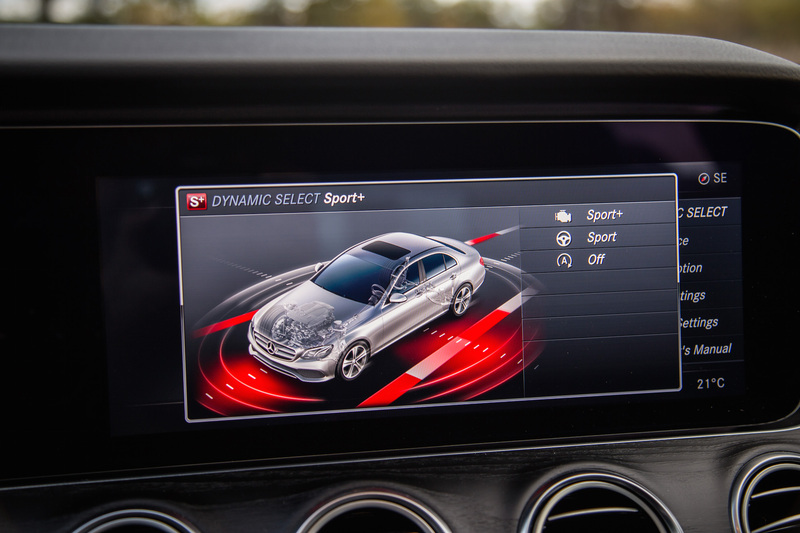 The most notable piece of tech is one they call Drive Pilot, which combines every radar and camera technology in the book to make the E-Class semi-autonomous, meaning the car will drive itself for the most part, hence the word “semi”. 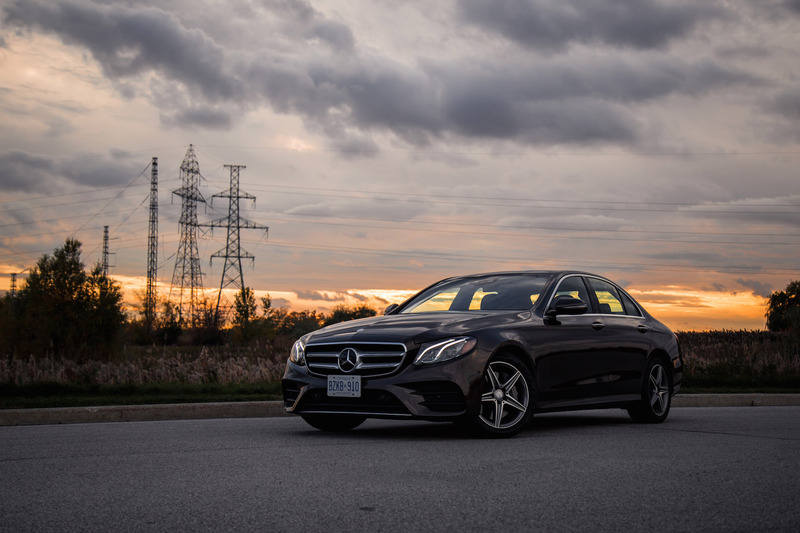 The E-Class will control the gas pedal, the brakes, and the steering, so you can relax your hands by your phone, I mean lap, and let the E-Class do all the dirty work. Drive Pilot works best in stop and go traffic and on the highway. So go ahead, flick the button, set the cruise control, and the E-Class will guide itself by staying between the lines and tailing the car in front of you within a preset distance. 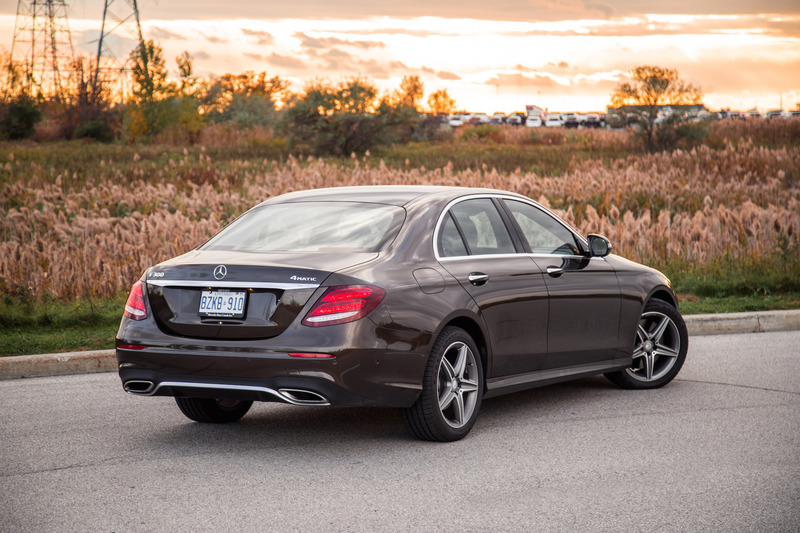 And unlike rivaling “Lane Keeping Assist” systems, the E-Class doesn’t wait until its about to veer into the neighbouring lane before adding any steering input – the E-Class will always keep the car smack dab in the center. It can also change lanes for you via a simple flip of the signal stalk, as long as you are clear of any obstacles. 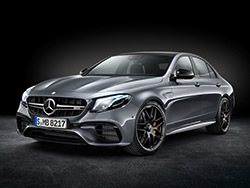 This may not sound like anything “game-changing” at this point, but what makes the E-Class’ system stand out is that it can be used at any speed between 0 to 210 km/h, and for up to five minutes without any driver intervention (tested). 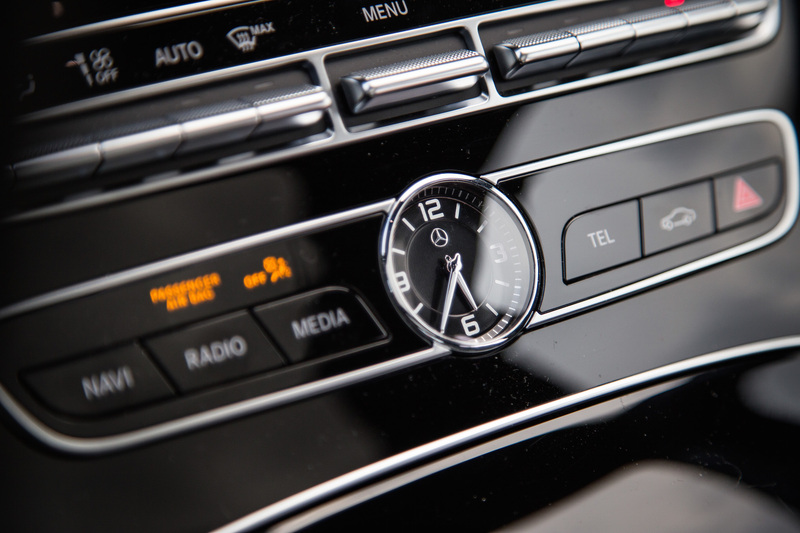 Most systems need you to wiggle the wheel every few seconds or so, but the E-Class can go solo on the highway for quite a long period of time before beeping like a madman to make sure you are still alive. 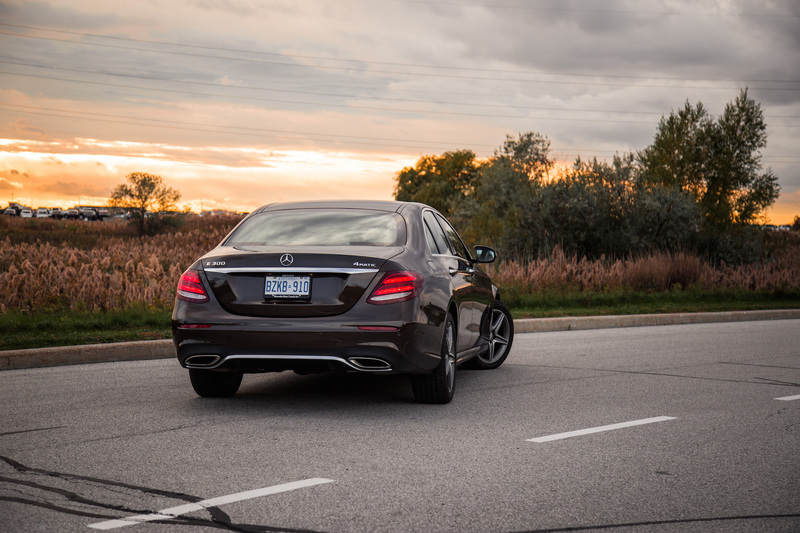 As a general guideline, the E-Class will demand driver input when the car isn’t 100% sure of the road guidance ahead, or when the lane markings aren’t clear. One criticism that I have is that the autonomous system can’t handle sharp turns very well, especially at higher speeds. 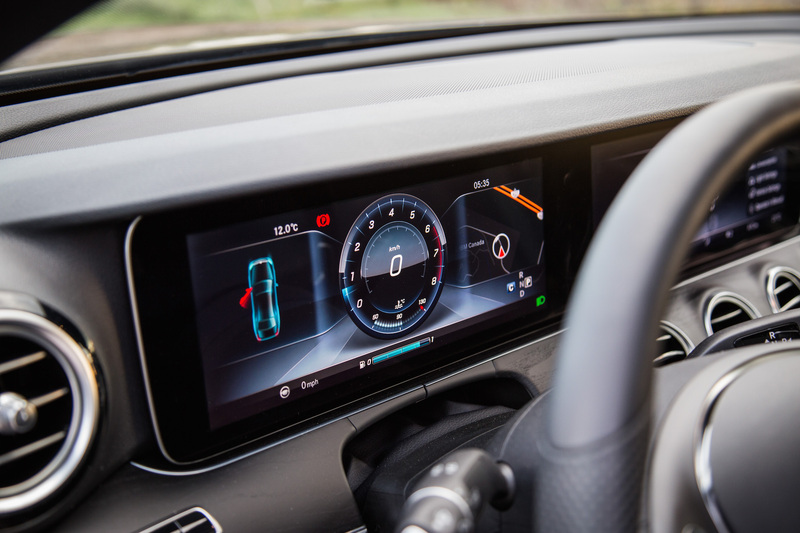 The cameras and radars don’t seem to react fast enough to add steering input to safely guide it through bendy roads – so the best practice is to grab the wheel whenever curves are shown up ahead on the navigation. Many drivers new to this semi-autonomous tech will probably find all this Drive Pilot stuff gimmicky and useless, and I was skeptical at first too. 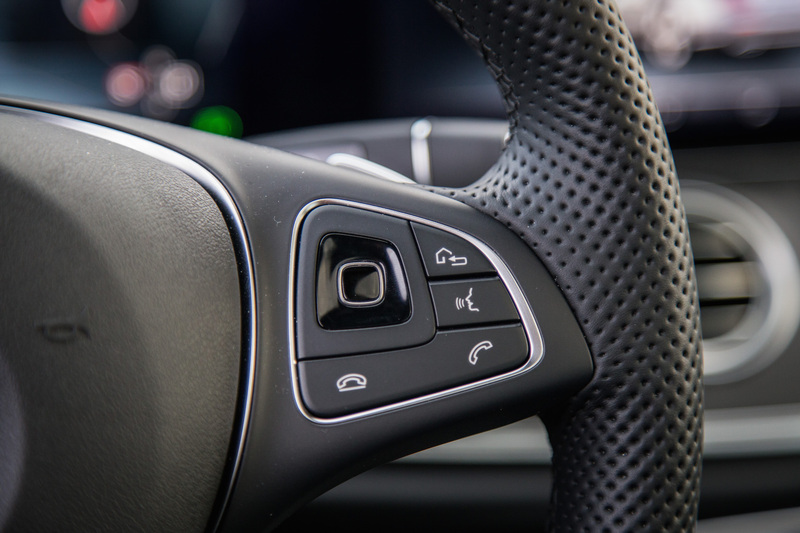 It takes all but a few minutes behind the wheel to grow accustomed to the auto-steering, and like the “useless” creature comforts we all used to criticize in their infancy, like a heated steering wheel or a massaging seat, over time Drive Pilot becomes hard to let go. Other notable tech features include PRE-SAFE, which will emit an auditory frequency to precondition your ears to a loud noise when it senses an impending accident, and in the event of an impact, the seat bolsters will inflate and distance you away from the point of contact. 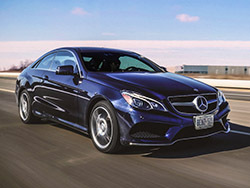 This, in addition to active braking when it senses a collision from the front, side, or rear, and active steering assist when it comes down to evading a forward coming object, makes the E-Class one of the most highly technological and intelligent vehicles on the market. And the best part? It actually works. So what happens when you actually grab the steering wheel and take it off auto-pilot? Well you won’t be disappointed. 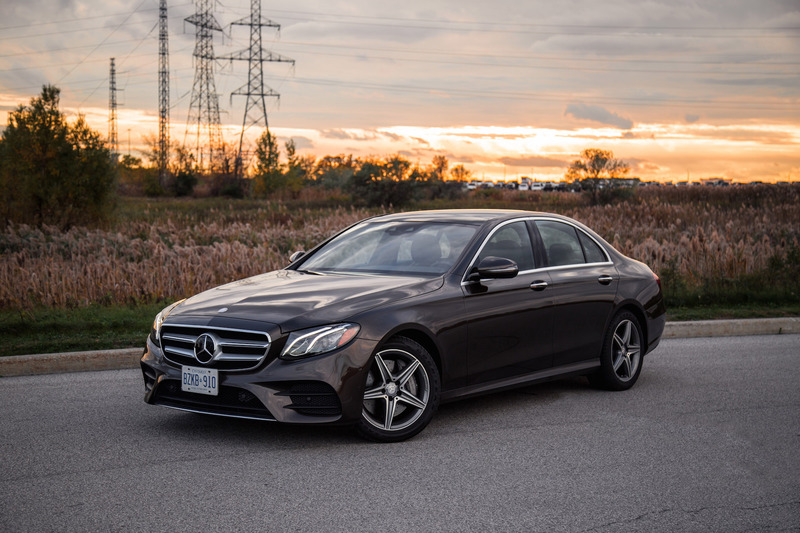 Though the E-Class is first and foremost a luxury sedan, its buttery smooth powertrains and intelligent transmissions keep it from operating like a bland vanilla Camry. 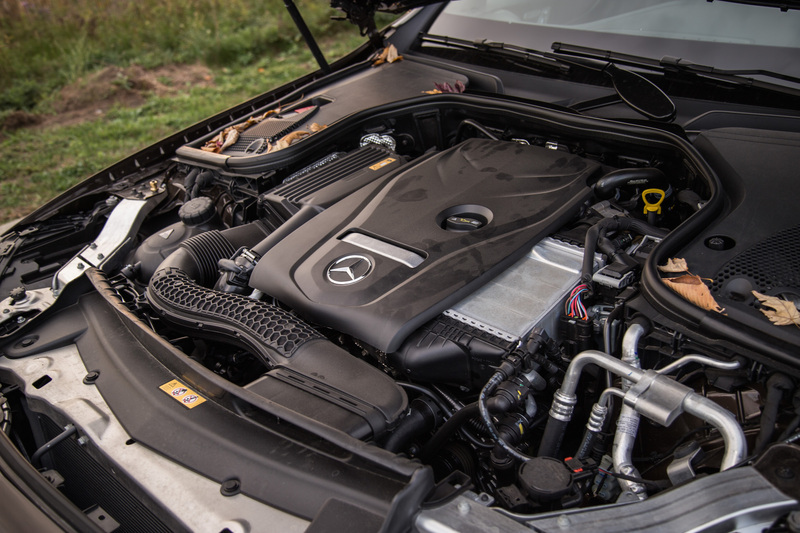 The E-Class can be had with three different engines: the E 300 gets a turbocharged 2.0L four-cylinder delivering 241 hp and 273 lb-ft, the E 400 receives a 3.0L twin-turbo V6 punching out 329 hp and 354 lb-ft, and the current (the E 63 comes out in 2018) range-topping E 43 tops out with the same V6 but tuned to produce 396 hp and 384 lb-ft.
All-wheel drive comes standard on all models, as does a 9-speed automatic transmission. Now if you were thinking that nine might seem like a lot of cog swapping, you’d be right. However the slushbox is rather decisive and doesn’t spend any time daydreaming about which gear it should switch to next. This is not a Jeep, after all. 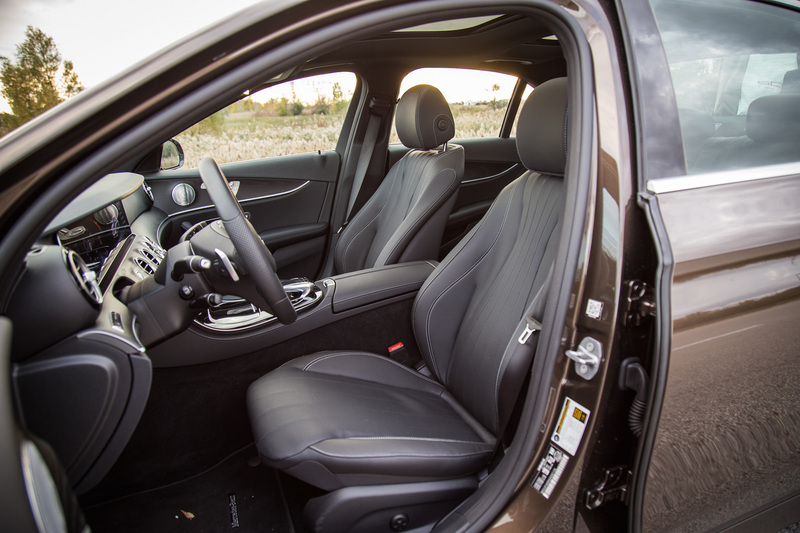 Wagon lovers can rejoice – you can still have one in E 400 guise with a rear-facing third row bench, but diesel enthusiasts will have to wait – there’s been no news of the “BlueTec” making its way back to the E-Class lineup. You know whom to thank for that. 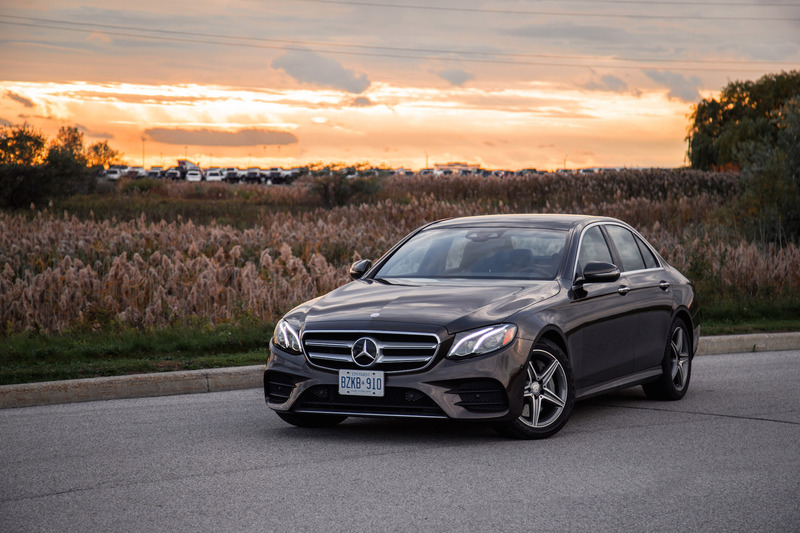 We tested the volume seller, the E 300, and while it falls 61 hp behind the outgoing E 350’s V6, it’s torque figure is identical, providing a drive that isn’t breathtaking but rather smooth and refined. The 2.0L four-pot doesn’t feel stressed under heavy load and has good get-up with a shove once it digs deep into the powerband. 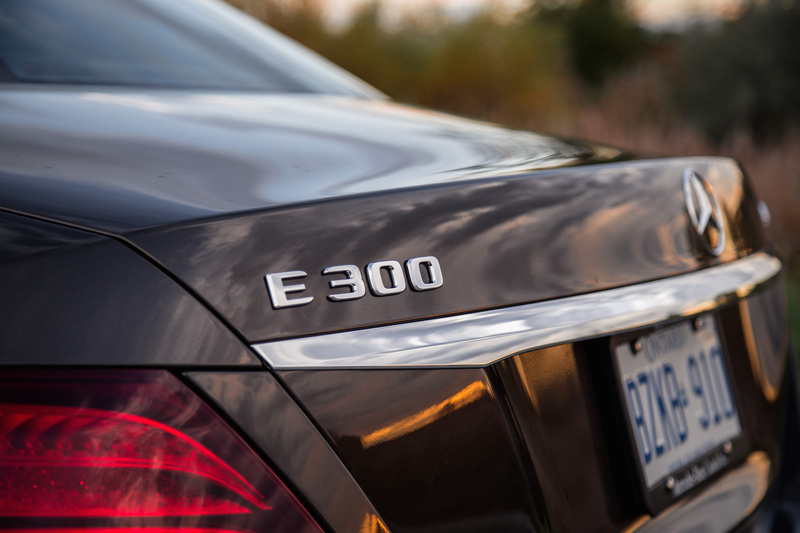 While the extra power from the E 400’s V6 would be nice, it’s not even close to being necessary. The ride is also sublime, offering phenomenal body control and there’s even an optional air suspension that can adjust the springs at each corner according to road conditions and the driver’s demands. 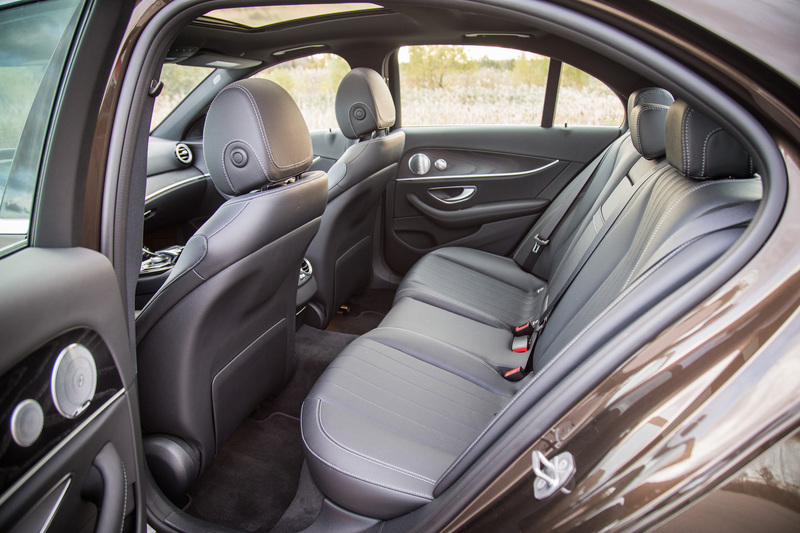 Whether you’re still confused if it’s a C 300 or an E 300, the interior will be the definitive answer. 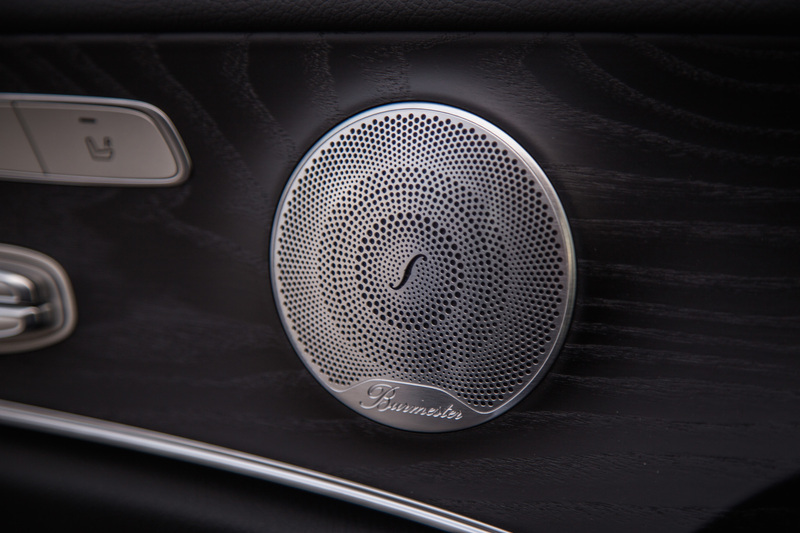 Inside is a businessman’s paradise of high quality materials, a sweepingly elegant center console, and two enormous widescreen displays taken straight from the S-Class. The dual screens are physically connected too for a seamless look, and offers a well-thought out design that visually stretches and widens the perception of the dashboard. Along with the continuous ambient lighting that zips and zags around the entire cabin (with 64 different colours), the E-Class’ interior appears bigger than it really is. It’s a nice effect. 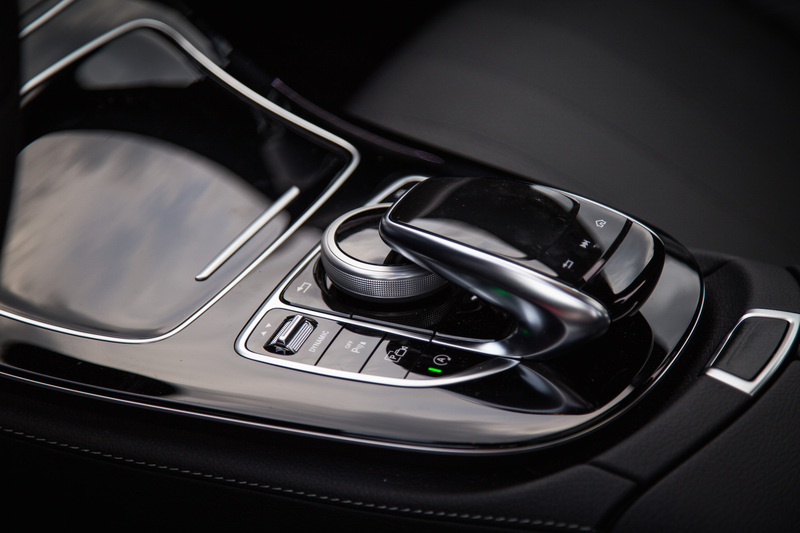 It is also the first time we’ve seen Mercedes-Benz incorporate touch-sensitive buttons on the left and right steering wheel spokes, allowing you to swipe in each direction to navigate through the instrument panel and infotainment. The engine start button has also been redesigned, and no longer looks like a tacked on afterthought. The center cubby is what really bugs me though. The way it’s designed to fold up and inward ruins the fluidity of the design. When the panel is closed, it is sleek and flush with the surfaces but when opened (as it will be in most cases, because even stowing an iPhone 5 in there will prevent it from closing shut), it looks rather hideous. That, along with the redundant center touch and dial controls, are my only nitpicks in what is otherwise, a beautifully crafted interior with all the modesties of a C-Class and the amenities of an S.
I’ve seen automakers try their hand at autonomous driving and to be honest, most of them are in their infancy of research and development. 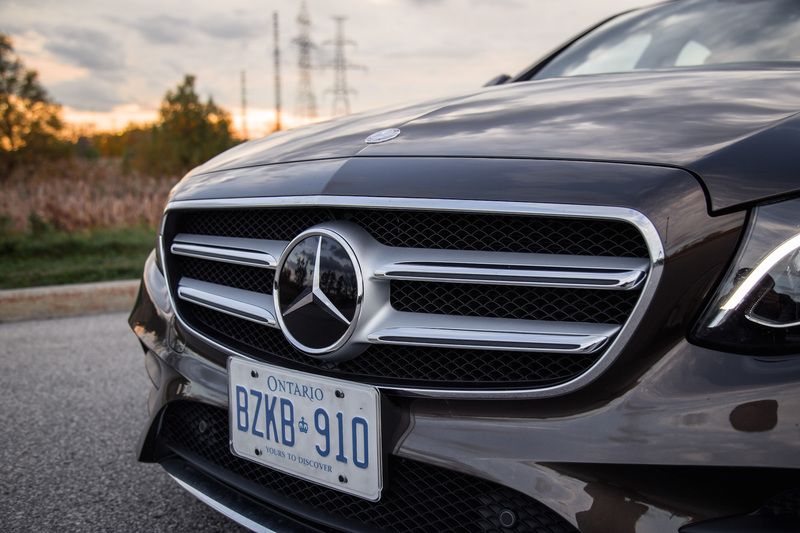 Having the E-Class lay down the framework and showcase Mercedes-Benz’s advancements in the field is impressive, and its semi-autonomous features and safety tech stretch the boundaries and limitations of what is possible. 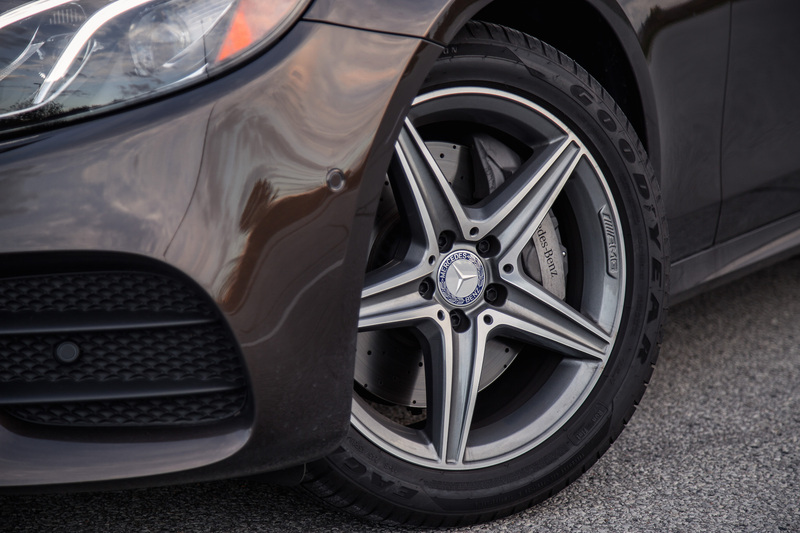 All of it actually works as advertised, giving us even more confidence behind the wheel of the silver star. We can’t wait for this tech to trickle down (and up) to other Mercedes-Benz’s in the lineup but until then, the E-Class is at the forefront of the audacious self-driving war. 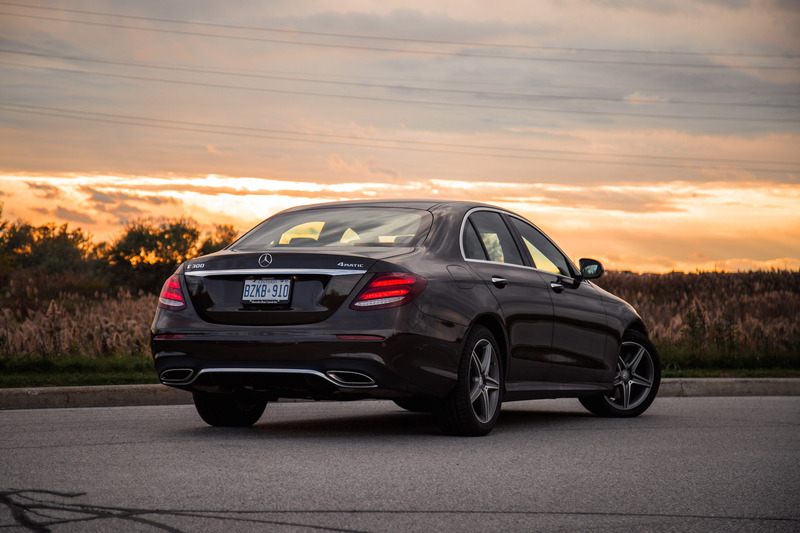 It’s just a cherry on top of what is otherwise, a wonderfully crafted mid-size sedan.